You are here: Home / Dogs / Can You Walk My Dog While I Am At Work? The fast answer to “Can You Malk My Dog While I Am At Work?” is yes, we would love to walk your dog while you’re at work! Most of our dog walks take place while dog parents like yourself are out of the house. Trusty Tails can come to your home while you are at work as a means of providing a bathroom break and exercise for your dog. A scheduled dog walk between the hours of 8am and 8pm. We’ll come any day of the week, including holidays, but we like to give our staff adequate time to lead their own lives too. Many are also pet owners and need to take care of their fur babies as well. Two working sets of keys for your home. This includes any necessary fobs or access cards we need to get into your building. One set will be with your walker while the other is stored safely at our office in case of emergencies. Your dog needs current license and identification tags on a collar/harness that fits properly. As with humans, your canine companion needs to have proper ID on hand (or paw) at all times. We don’t want anyone slipping away or being uncomfortable while out for a walk, so please be sure that your dog’s collar and/or harness is fitted to them. Our walkers will double-check this at each visit. A 4-6 foot leash along with a harness. Kind of hard to walk a dog without a leash, wouldn’t you say? Please, no retractable leashes. Your dog is healthy and current on all vaccinations. We like to hope that nothing will ever go wrong, but some things are out of our control. Should anything happen, it’s important to know that your dog is up to date on vaccines. If your pup is ill or injured, please let us know and we will adjust their visits accordingly to prevent further harm or spread of infectious diseases. Your dog is friendly and socialized. Safety is a priority among our staff, both for your dog and everyone around him. Trusty Tails is fully insured and bonded so you’re never liable…however, we prefer to prevent incidents rather than treat them after the fact, and knowing that your pet is friendly and sociable helps us to do so. This isn’t a necessity, but our walkers sure do appreciate it! 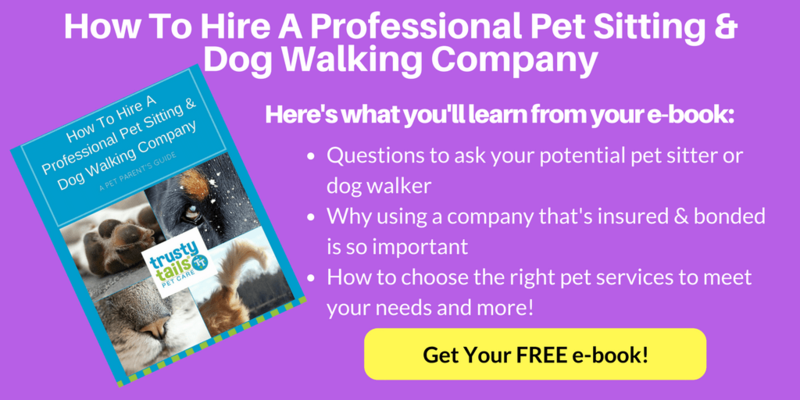 Are you ready to schedule a walk for your dog? So, “Can you walk my dog while I am work?” Yes we can! Head on over to our “Book Now!” page and schedule a walk. – we look forward to meeting you and your furry family soon! Next Post: Group Dog Walk vs Solo Dog Walk?